Develop a UX and interface design for the bra fitting guide for use on desktops, tablets and mobile devices, designed for multilingual implementation in bonprix’s international online shops. The aim was to seamlessly integrate the guide into the bonprix customer journey. bonprix customer feedback and return trends showed that, when shopping for bras in particular, most women want advice on size and fit. The idea was that a bra fitting guide would also bring this service to bonprix’s online shops, where it was not yet available. Above all, the goal was to support customers in selecting the right size and fit, to satisfy their need for reliable advice. 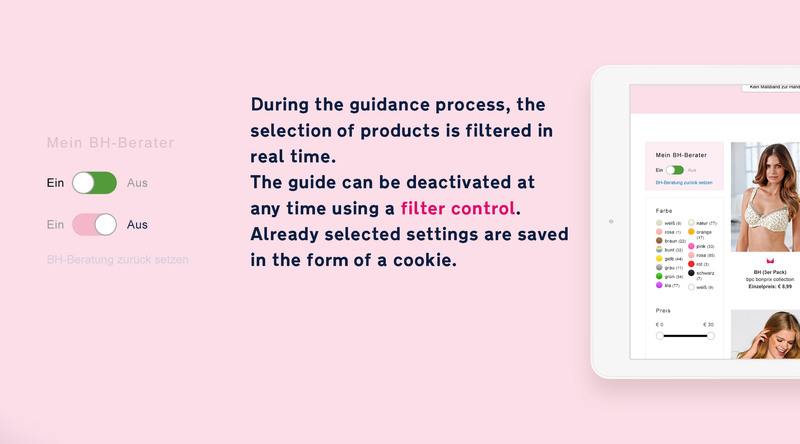 Using a fast, very easy and intuitive process, customers enter their personal data and individual preferences and, in just four steps, receive personalized bra recommendations. Detailed tips – measurement-taking illustrations and a video tutorial, for example – help customers take the right measurements. In addition, the guide asks about personal anatomical features and preferences. This is accompanied by editorial content such as tips that help women understand if their bra fits right and if they are in fact wearing the correct size. The results present each customer with a wide selection of perfectly fitting bra options, making it much easier to decide on a purchase. The guide was developed to be very user friendly and with customers’ needs in mind. To achieve market readiness, the concept and design were subjected to extensive usability testing in the course of their development. In addition, insights from she-commerce were taken into consideration. The result is a user-centered UX and interface design optimized to make the guidance process as smooth as possible – while also offering customers an engaging online shopping experience. Specially developed illustrations, whose style was conceived with the help of feedback from customer surveys, are both informative and engaging. Together with the intuitive interface design, they ensure that the guide not only provides useful results but is also really fun to use. Success evaluations showed that customers were very satisfied with the bra fitting guide already shortly after it went live. There was a five percent increase in demand for bras – even as the rate of return decreased. For mobile devices, we redeveloped the UX and interface design for the bra fitting guide from scratch. It is fundamentally different from the desktop version to ensure optimal touch functionality on small smartphone screens. Even though smartphones have small screens, it was important to us to create a visual design that is both easy to use and engaging. Shopping on smartphones is becoming increasingly popular, and customers expect the same ease they are used to from shopping online on their desktops. The bra fitting guide introduces shopping advice to bonprix’s international online shops – a service familiar to customers from brick-and-mortar retail stores and for which there was great demand. 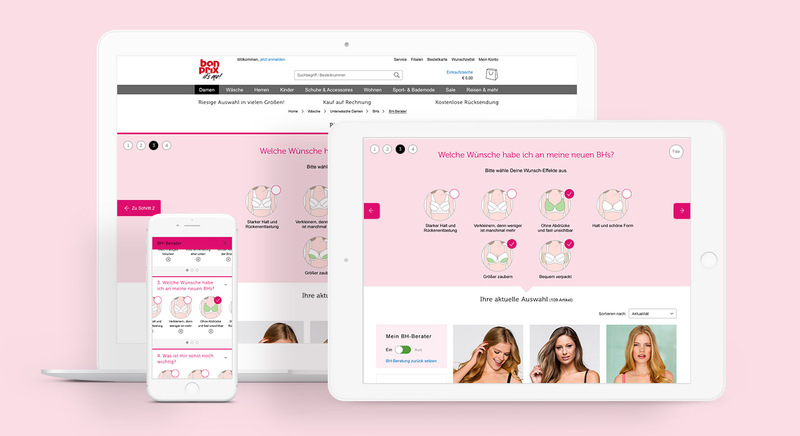 The online shopping guide not only increases customer use and satisfaction, but – thanks to its inspiring visual approach – also offers an engaging way to enter bonprix’s world of bras. The targets set – reducing the rate of return and increasing demand in the important bra product range – were all met in just a short time after the tool was rolled out. Thanks to these very good results, there are already plans to adapt the successful bra guide concept to other product ranges, such as jeans, for example. BONPRIX is a subsidiary of the Otto Group and one of the leading vendors for inexpensive fashion in Germany and Europe.The company offers affordable fashion for everyone, under the motto “bonprix – it’s me!” Its product range covers everything from clothing, underwear and shoes to furniture and household items. Since the 1990s, the company has pursued a multichannel strategy, including catalogue business, brick and mortar stores in Germany, Italy, Austria and Switzerland, and e-commerce. Over the past few years, the bonprix.de online store has developed into the company’s most important sales channel, and is one of Germany’s top-ten online stores.